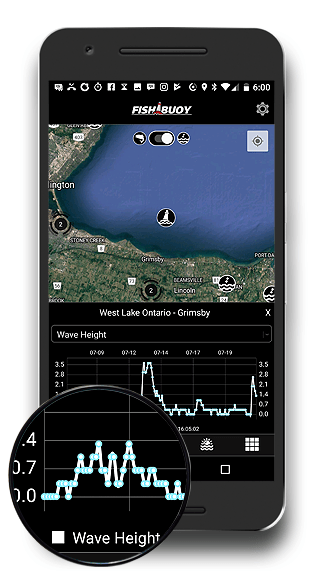 We connect directly to NOAA's vast network of North American marine buoys to help you understand the wave conditions you are heading into. Anglers use this information for boater safety in addition to selecting where on a lake they will fish first. Understanding historical and current wind conditions can help anglers determine potential areas holding fish. WInd direction and magnitude influence water currents. These changes move food sources and bait fish to different areas of the lake. Start tracking how changes in barometric pressure affect certain species of fish. Capture pressure with each photo, then refer to historical and real-time values in the field to plan for your next trip. Open water fishermen know the importance of surface water temperature tracking. FISHBUOY exposes real-time and historical water temperatures so you can locate your target species.